This is another part in support of HMS Acasta's Press Gang Week. 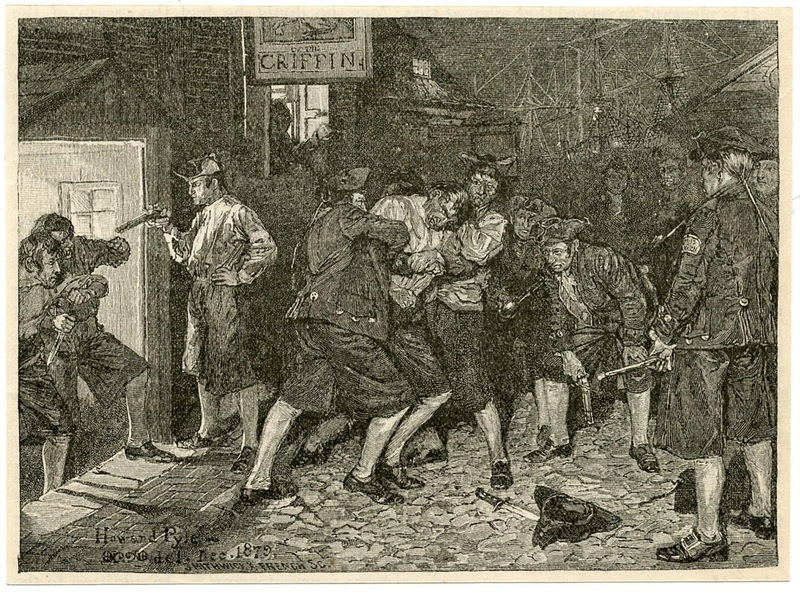 "The Press-Gang in New York," Howard Pyle, 1882. When we think of impressment we think of the Royal Navy, and this is not without reason. British impressment was a factor in countless court cases and two wars with America. Thanks to the American Naval Records Society, and their remarkable effort to convert all of the gargantuan collection Naval Documents of the American Revolution into searchable .pdf files, I learned of an attempt at impressment by an American naval officer during the American Revolution! We do not know that you can have any Authority, under which to justify such violence, or to interfere in any manner with any Person, who has not voluntarily enlisted in the Continental Marine Service. - If you have any Person, under Colour of his being impressed, we require you instantly to discharge him, and to forbear from a further Exercise of Such an unwarrantable power. It is the Office of Government to protect every Subject in his Liberty and property, nor shall we who are honoured by our Country with the highest Department, be idle Spectators of the Oppression of any man in it. Nicholson is a notorious figure in the history of the Continental Navy. A native of Chestertown, Maryland, he was far better at navigating the politics of Congress than he ever was commanding a ship. It was through this maneuvering that he gained command of the Virginia. The Virginia, despite her name, was of Maryland construction, having been laid down in Fells Point. Nicholson was given orders to take her out and run the British blockade of the Chesapeake. He failed numerous times in this mission, and also failed to keep his restive crew in check. Desertions were "so numerous that Virginia was unable to leave the docks." A frustrated Nicholson eventually turned to impressment. It was a practice he would continue into 1780, despite the numerous official and unofficial protests. What makes this letter particularly interesting is the way in which Governor Johnson frames Captain Nicholson's transgression: "It is the Office of Government to protect every Subject in his Liberty and property." The very foundation of the rebellious government was liberty. The English themselves had long been uncomfortable with impressment, but the Americans were taking a stand on it. Nicholson's attempt appears to be the only time an American naval officer used press gangs. Are you aware of any others?